As the mother of two wonderful girls, I have a huge soft spot for flower girls on wedding days. I love every single thing about this photograph because it reminds me of my own daughters when they were this age! I thought that this image was a wonderful competition image because of many, many elements. One, you have a great connection between the subject and the camera. I had waited so patiently and for so long to capture this frame that the flower girl had completely forgotten about me - this was important because her emotion and facial expressions were genuine. She wasn’t playing for the camera, this was a real moment. Two, there is excellent motion to the image. 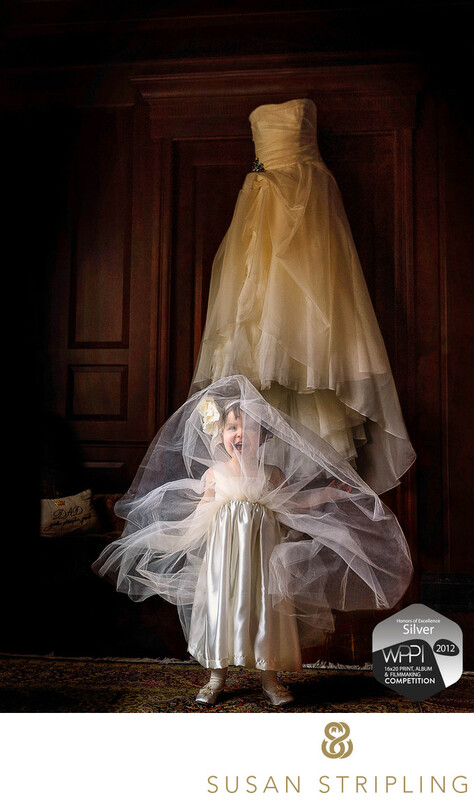 There is a wonderful juxtaposition between the fluttery movement of the flower girl’s skirt and the serene stillness of the bride’s dress hanging on the door behind her. I love the color tones in the image and the sidelight from the window illuminating the girl. I chose to enter this image into the WPPI 16x20 International Print Competition in the Wedding Division Bridal Party/Family and Friends category. I debated between this and the Photojournalism Division : Wedding Photojournalism category but ultimately decided that this was best suited in the Bridal Party division. The image scored well enough to hang in the gallery at the WPPI convention in Las Vegas in 2011 but not well enough to win an award in that category. Alas, you win some and you lose some! While many photographers would be thrilled with an 80+ score and a chance to hang in the gallery, I set my sights high - all the way to the awards podium!Keywords: philadelphia (435), Please Touch Museum (18). 1/160; f/4.0; ISO 1400; 42.0 mm.